Here You get to know about the latest Technology,gadgets,Eco-friendly Items,Autos and latest engineering stuff.Dont forget to Bookmark this blog. The world's first bionic man Rex, created using nearly $1 million-worth of state-of-the-art limbs and organs - synthetic blood from Sheffield University, prosthetic legs and ankle from MIT, retinas from Oxford University, artificial kidneys, pancreas and spleensfrom University College London and artificial lungs from Swansea was unveiled at London's Science Museum on Thursday. 'Rex', a two metre tall artificial human, is displayed at the Science Museum in central London on February 5, 2013. 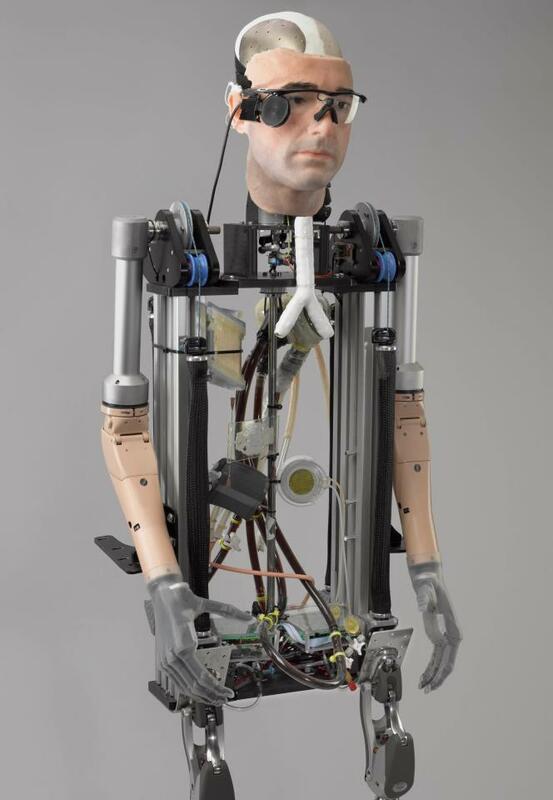 The British robotics designers claim it is the world's first completebionic man, featuring artificial organs as well as fully functioning limbs. It will be on public display until March 11. Rex is a mixture of Robocop and Frankenstein, Rex - who has the face of a man is 6.5-feet tall with striking brown eyes. He was jointly built with the help of over 18 companies and universities and for the first time gives tangible hope that replacing body parts with man-made alternatives can finally be possible. 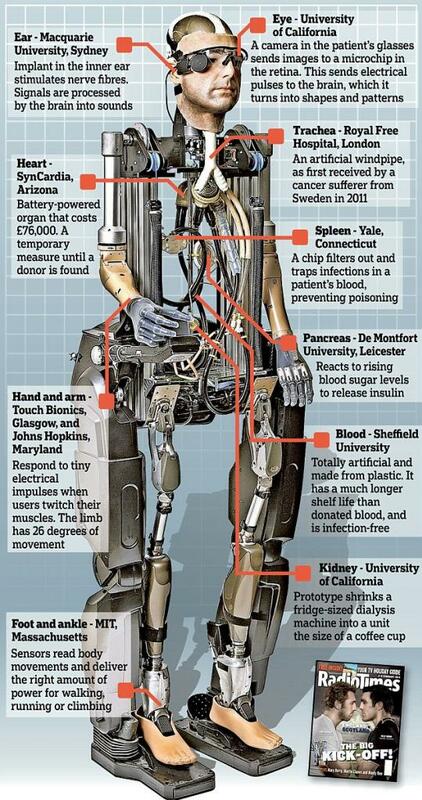 The 640,000 GBP (1 million US dollars) humanoid has a distinctly human shape and boasts prosthetic limbs, a functional artificial blood circulatory system complete with artificial blood, as well as an artificial pancreas, kidney, spleen and trachea. 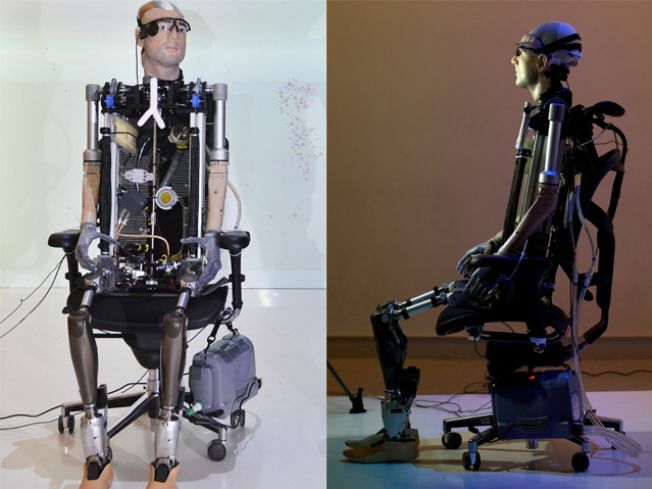 Rex has a distinctly human shape and boasts prosthetic limbs. In the two centuries since Mary Shelley's Dr Frankenstein brought a 'monster' to life, the subject has fascinated science fiction in books, comics, film and TV. Now research on advanced prosthetic arms and legs, as well as artificial eyes, hearts, lungs - and even hybrids between computer chips and living brains - means that scientists are finally able to replace body parts and even improve on human abilities. 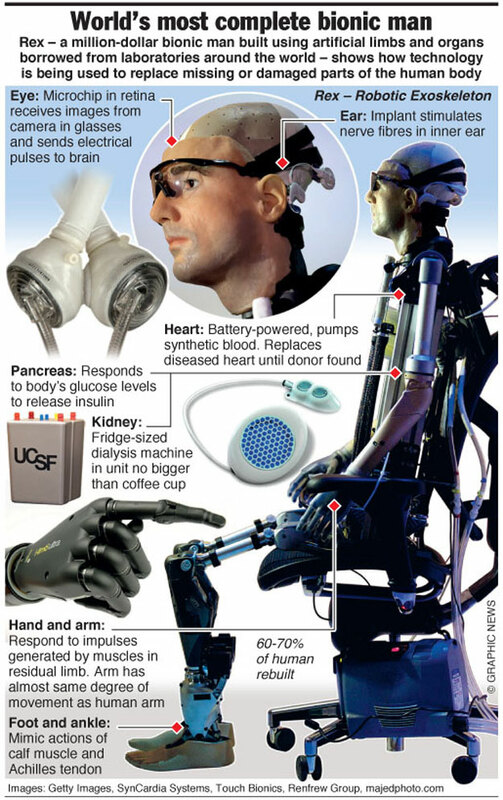 The project involves Bertolt Meyer, a social psychologist from Switzerland who has a bionic hand himself. He met scientists working at the cutting edge of research to find out just how far this new technology can go. Bertolt has had prosthetic hands since he was a child. His new £30,000 bionic hand, which can grasp and twist, is the most advanced on the market. But technology is moving so fast that Bertolt's bionic hand could soon be obsolete. A far more advanced arm is being developed, the product of more than $100 million-worth of research into bionic limbs, funded by the US military. Bertolt visited Michael McLoughlin at Johns Hopkins University's Applied Physics Laboratory to try out the latest prototype - the Modular Prosthetic Limb (MPL).